Vitamin B6, also called Pyridoxine or Pyridoxal Phosphate, is the most quickly metabolized member of the B-vitamin family. It too is a water soluble vitamin. Because of its rapid metabolism and solubility, it travels throughout the body very quickly. So fast in fact that it takes only about eight hours for this vitamin to pass completely through. It is therefore very important that this vitamin is replenished regularly. Like the rest of the B-vitamins, Pyridoxine plays a role in the metabolism process that converts proteins, fats and carbohydrates into a form of energy the body can use. Vitamin B6 helps produce healthy hemoglobin by making more iron available. Even more impressive, this vitamin plays a role in the production of over 60 different hormones, enzymes, prostaglandins and neurotransmitters. Vitamin B6 is directly involved in the production of the mood, sleep and appetite regulator called serotonin. Vitamin B6 can help prevent the formation of painful kidney stones and adequate quantities will help promote a healthy immune system. It helps lower the levels of bad cholesterol in the blood. This is a very important benefit because fatty plaque deposits are less likely to form on artery walls, greatly reducing the risks of heart attack. It's believed that the way Vitamin B6 joins together with Folic Acid and Vitamin B12 also helps reduce the risk of heart attack. Together this combination may lower homocysteine levels. Vitamin B6 is found in many of the same foods in which the other B vitamins are found. Poultry, pork, fish, milk, eggs, nuts, seeds, brown rice, whole grains, bananas, carrots, avocados, soybeans and whole grains are a few of the sources. Women need 1.6 milligrams of Vitamin B6 each day and men need to take 2 milligrams. 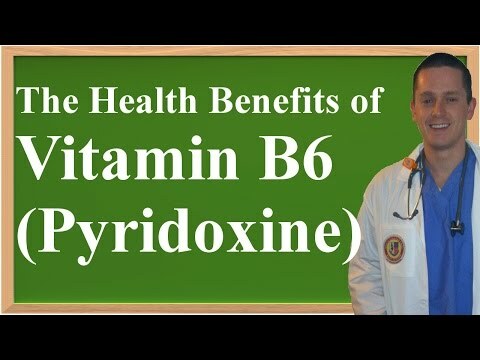 One of the most important things to know about Vitamin B6 or Pyridoxine is it is one of the few vitamins that, taken in excess, can actually be toxic. Taking more than 2 grams a day can result in irreversible damage to the nerve endings and to the entire neurological system. Although up to 500 mg/day is considered high, this level still is considered safe. People who are experiencing a Vitamin B6 deficiency suffer from symptoms that include apathy, moodiness, depression, fatigue, hair loss, insomnia, a loss of appetite, dry or cracked skin on the tongue or lips and anemia. This deficiency can also cause the nervous system to completely break down. Insufficient levels of Vitamin B6 are especially troublesome in children and babies, both of whom are more vulnerable to this type of deficiency. If left untreated, affected individuals can go into a convulsion, or become irritable, or anemic. People who are pregnant, people who drink excessive amounts of alcohol, the elderly, teenagers, and women who take the birth control pill are more vulnerable to developing a Vitamin B6 deficiency than others. The reason has to do with how each group impacts the body's ability to absorb this very important vitamin.